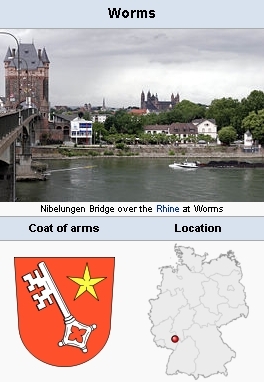 Worms, a town on the Rhine in the Palatinate, Ger­many (population 56,500 in 1953; 82,212 in 2006; coordinates: 49° 37′ 55″ N, 8° 21′ 55″ E), was in 1527 a center of Anabaptist activity. In January 1527 both Hans Denck and Ludwig Haetzer came to Worms, where they completed and published their translation of the Old Testament Prophets (see Worms Prophets). There was probably no Anabap­tist congregation in this town before 1527. The rise of the Worms Anabaptist movement may have been the result of the work of Melchior Rinck, Haetzer, and particularly Denck, though Fellmann is of the opinion that Denck was not especially active here, leading a retired life. In any case it is clear that Denck deeply influenced Jacob Kautz, one of the Reformed preachers at Worms, who even before the coming of Denck and Haetzer opposed infant baptism. Kautz was won over for the Anabaptist principles; among his converts was his co-preacher Hilarius, who in turn con­verted many others. The clergy and the city gov­ernment at this time lived in a kind of vacuum between Catholicism and Reformation and did not seriously counteract Anabaptist activity. On 9 June 1527, Kautz attached seven Anabaptist theses on the door of the Dominican Church, invit­ing to a public debate on June 13. Whereas Hege held that these theses differed from the views of Denck, Goeters states that Denck was the very father of Kautz's theses. The disputation was not held in the way Kautz wished, because the Reformed (Lu­theran) pastors, either for the safety of their church or for political reasons, were not inclined to partic­ipate. The result was that on June 13 Kautz and other preachers gave a free testimony and broad explanation of their Anabaptist views to a large attendance. Thereupon both the Lutheran pastors and the Catholics tried to stop the movement. The Catholics denounced the theses to the Palatine Elector, saying that Kautz's ideas concerning bap­tism and communion were a horror for all true Christians. The Lutheran preachers of Worms, Ulrich Preu and Johann Freiherr, replied to Kautz's theses with "seven articles," which had been promulgated by the press. On 1 July the city council of Worms resolved to banish Kautz and Hilarius from the town. The next day the Reformed preach­ers of Strasbourg, who had anxiously followed developments at Worms, published Getrewe Warnung der Prediger des Evangely zu Strassburg über die Artickel, so ]akob Kautz, Prediger zu Wormbs, kürzlich hat lassen ausgehen. About the same time Denck and Haetzer also left the city. Rinck had already been banished. After the Ana­baptist leaders had been removed from the stage, Anabaptism in Worms soon declined, though a congregation still seems to have existed for a short while. Fellmann, W. Hans Dench, Schriften, 2. Teil. Gütersloh, 1956: 13 f.
Goeters, J. F. Gerhard. Ludwig Hätzer. Gütersloh, 1957: 97-99, 104-9. Hege, Christian. Die Täufer in der Kurpfalz. Frankfurt, 1908: 34 ff. Krebs, Manfred. Quellen zur Geschichte der Täufer. IV. Band, Baden and Pfalz. Gütersloh: C. Bertelsmann, 1951: No. 129. Zijpp, Nanne van der. "Worms (Rheinland-Pfalz, Germany)." Global Anabaptist Mennonite Encyclopedia Online. 1959. Web. 22 Apr 2019. http://gameo.org/index.php?title=Worms_(Rheinland-Pfalz,_Germany)&oldid=163384. Zijpp, Nanne van der. (1959). Worms (Rheinland-Pfalz, Germany). Global Anabaptist Mennonite Encyclopedia Online. Retrieved 22 April 2019, from http://gameo.org/index.php?title=Worms_(Rheinland-Pfalz,_Germany)&oldid=163384. Adapted by permission of Herald Press, Harrisonburg, Virginia, from Mennonite Encyclopedia, Vol. 4, p. 983. All rights reserved. This page was last modified on 5 March 2019, at 19:57.